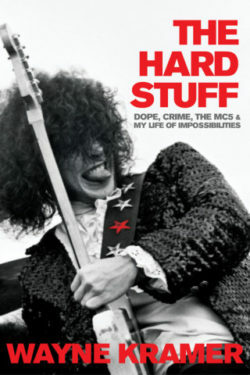 “The Hard Stuff: Dope, Crime, the MC5 and My Life of Impossibilities” is the story of legendary guitarist Wayne Kramer. From his childhood in Detroit where he found inspiration from the likes Chuck Berry and the Rolling Stones to his pursuit of “avant rock” with his group the MC5. Released via Da Capo Press “The Hard Stuff” is a 311 page biography recounting a life of rock and roll excess to prison confinement making all stops in between and any there-after. As gritty as the ground breaking groups music “The Hard Stuff: Dope, Crime, the MC5 and My Life of Impossibilities” is a brutally honest, in-depth look at M5 founding member Wayne Kramer’s life. Told by the man himself Kramer recounts his upbringing in a home with an abusive stepfather and how he channeled his inner frustrations about the world around him into some of the MC5’s most notable material. Though I found the chapters recounting his time with the band the following chapters after the group disbanding was where my attention was really held. Kramer painstakingly tells of his time in prison after a drug bust and the years after in which he struggled with addiction up through reconnecting with his biological father. “The Hard Stuff” is a roller coaster ride of emotion that keeps the reader interested and turning the pages. Not many people (if any) have had a life like Wayne Kramer and this book makes that abundantly clear. You don’t need to be a fan of Kramer’s music to enjoy this book as the author speaks his truth and does not shy away from darker periods of his life or difficult subject matter. For those hoping to catch the MC5 on the 50th anniversary tour this is the perfect foundation to help connect or reconnect with one of rock music’s most influential artists/groups. Stepfanie Kramer is appearing on the new hit TV series “The Secret Circle” on The CW this coming January. She is playing the role of Kate Meade. Stepfanie is know for her role of Sgt. Dee Dee McCall on the 80’s TV series “Hunter”. Media Mikes had a chance to chat with about her role in “The Secret Circle” and what we can expect from her character. Mike Gencarelli: Can you tell us how you got involved with “The Secret Circle”? Stepfanie Kramer: I went in for an audition much like everyone else. I must have delivered what they were looking for. My character Kate is a very interesting woman as she is rather complicated when making decisions. She loves her family and is a very strong lady who knows exactly what she wants. MG: You character is described kind of woman who can warm you with a smile but freeze you with a single glare, how did you prepare for this role? SK: (Laughs) I just patterned her after a family member. Everyone has someone like Kate in their family. MG: What can we expect from episode 10 in the show? SK: I can’t really say too much. Other than I play the grandma to a 16 year which is sort of funny because in real life I am the mother of a 16 year old. This episode will bring a different dynamic to mine and my son’s relationship. MG: Tell us about this rivalry with Dawn (Natasha Henstridge)? SK: It’s not so much a rivalry for attention. Kate is aware of certain things that are underway that other characters are not. I really can’t tell much more than that as a lot has yet to be revealed. It’s a really fun show to work on in that respect. Everyone who works on the show is really great. MG: How do you feel that “The Secret Circle” differs from other similar themed shows on TV? SK: I have been very fortunate with my career. Work is just work and each environment is always different. The experience is always something new each time. I really just enjoy the process of everything. MG: Can we expect more from Kate Meade the rest of the season? SK: There have been talks of this being a reoccurring role. They haven’t killed me yet so it’s a possibility. The response from the network has been very kind and that has been great. It’s always nice to know people appreciate what you do.